On September 13, 1814 at 3:00 pm, the members of the Committee of Vigilance and Safety reconvened for an afternoon meeting. Continuing the discussion from their morning meeting, feeding the thousands of troops stationed around the city remained a serious concern. 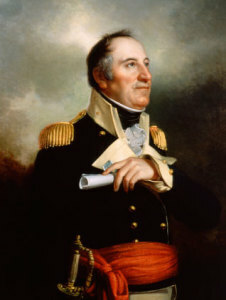 The Virginia militia in the Sixth Brigade under Brigadier General Hugh Douglas had been called up for the defense of Washington on August 22 but arrived too late to join the forces at Bladensburg. After the burning of Washington, the Virginia militia were ordered to Baltimore where they arrived with little ammunition, none of the equipment they needed to set up camp and no food to eat. These 24 hours commences with fresh Breeze and clear Weather. At 3 PM came up with and captured the British Schooner Rapid (formerly of Baltimore.) Tha. Dodd Master, from New Foundland bound to Lisbon, with a Cargo of Fish. took out several small articles dismantled and burnt her, at 9 PM got through with the Rapid and filled away head as p. log. On the morning of September 13, 1814, near 8:00am, the members of the Committee of Vigilance and Safety met. With around 15,000 troops in Baltimore one of the most pressing issues is how to keep the militia fed during the fight against the British. While the committee met, British bombs continued to fall on Fort McHenry with as many as four or five bombs in the air at once. Two-thirds of the guns at the fort could not even reach the British bomb ships. Around 9:30am, George Armistead gave the order to cease firing. He had fifty-seven cannons at Fort McHenry but none of them had the range to reach the British ships. By midnight the campfires of his regiments were blazing in the fields around Worthington’s mill. Behind them and to their right the work on Loudenslager’s hill drew a long arc of redly winking light… To the left flared the watchfires of General Winder’s brigade, Douglass’s Virginia militia…. The rain came a little after midnight, without wind or thunder but in drenching torrents. It beat with a low, unbroken roaring on the fields and roads. Fires sputtered and went out. The trenches became flooded ditches, the militia garrisons stood ankle deep in muck.